Australia have included three uncapped players in a 31-man squad for their Test against New Zealand in Japan later this month. 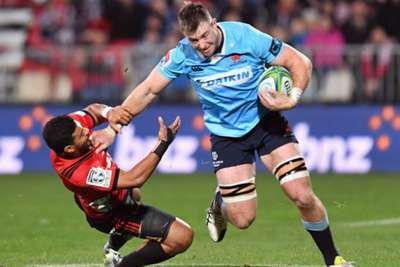 Waratahs duo Jed Holloway and Jake Gordon and Rebels flanker Angus Cottrell could make their debuts when the Wallabies face the All Blacks in Yokohama on October 27. Reds centre Samu Kerevi, who missed the Rugby Championship due to a bicep injury, returns in a boost for Australia. Sekope Kepu is in line for a 100th Test appearance for Australia and would become just the ninth centurion for the Wallabies. Wallabies coach Michael Cheika is under pressure after his team only narrowly avoided finishing bottom of the Rugby Championship. The meeting in Japan marks the third Bledisloe Cup clash, but the All Blacks have already claimed the trophy for a 16th straight year. Australia: Jermaine Ainsley, Allan Alaalatoa, Rory Arnold, Tom Banks, Kurtley Beale, Adam Coleman, Angus Cottrell, Jack Dempsey, Folau Fainga'a, Israel Folau, Bernard Foley, Will Genia, Jake Gordon, Ned Hanigan, Dane Haylett-Petty, Reece Hodge, Jed Holloway, Michael Hooper, Sekope Kepu, Samu Kerevi, Marika Koroibete, Tolu Latu, Jack Maddocks, Sefa Naivalu, Brandon Paenga-Amosa, Nick Phipps, David Pocock, Izack Rodda, Rob Simmons, Scott Sio, Taniela Tupou.